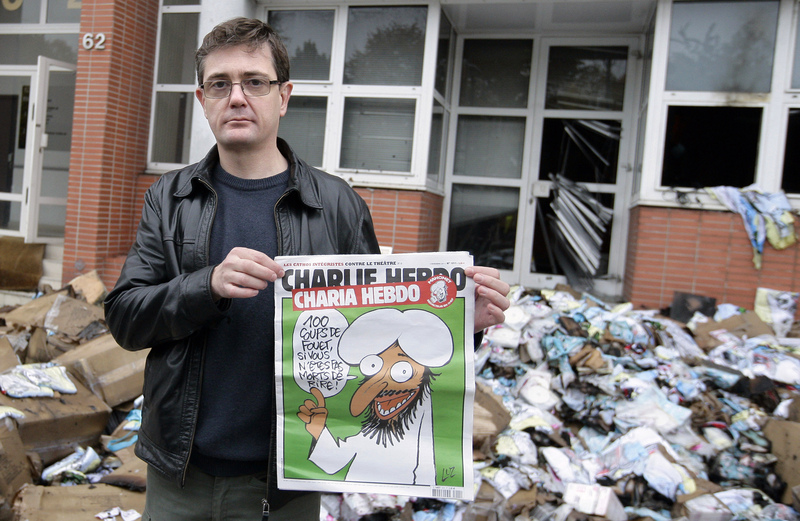 A week ago, the offices of the French satirical paper Charlie Hebdo were burned down. Islamist party (the Ennahda party) as the leading party in Tunisia (a result which, incidentally, appears not to have greatly bothered most European media). respect he is not unique. He follows in a long and ignoble line of useless idiots. opinions’) Index on Censorship managed to land it wrong. to promote van Gogh’s new film on the assassination of another critic of Islam, Pim Fortuyn. security protection to prevent people from killing him. In other words, the Crumleys of this world are not few in number. In the struggle for the right to say things which are serious or silly about Islam, there are plenty of people on the wrong side. that will end up mattering most. to publish the book. Shortly afterwards the office of that publisher in London was the scene of an attempted fire-bombing by some British-based Islamists. possibility whatsoever of having to defend anything to the death. worst thing that any British journal can imagine doing today is to run a cartoon of Muhammad. Not because – as they all say in public – it is insensitive, or provocative or offensive. people wonder why it is that cultures go awry we will be able to point to moments such as this: when the foundations of your values are under assault and the walls are manned by phonies and fools. Is Chris Huhne proving coalitions don’t work?